I am here just briefly to share a card that I made to pay tribute to the great Whitney Houston, who as you all know passed away unexpectedly yesterday. She was such a timeless voice and for many of us, her songs were the soundtracks to our lives. I decided also to make a small video with a few pictures I found via internet. When I was trying to decide a song to play, I just couldn't choose a Whitney song. There are just too many to choose from, too many wonderful and amazing songs. So, I decided instead to use a piece of beautiful music that I think reflects her beauty not only on the outside; but the inside as well. Life is precious, and time past is time gone forever. Love those around you passionately, completely; and forever. I hope everyone is having a happy start to their weekend. Mine has been productive already this morning; but now I intend to just relax and curl up with my book for as long as the kids are occupied (and my oldest is still asleep!) I actually have, not one; but two cards to share with you today! I know, right?! I actually managed to get both of these done yesterday whilst the kids were at school; but didn't have a chance to get them posted. In other news, I am a little sad to report that none of my cards were selected for Paper Crafts Stamp It 9 call. I was a little discouraged; but I know I'm not the only one either. I thought about going and ahead and sharing what I submitted; but I think I'm going to just hang on to them for a little longer. I haven't quite decided if I want to submit them for Stamping Royalty or not. The competition for getting published is stiff, that's for sure! Anyhow, enough of my sob story, let's get to these cards!! The first one is for the 2nd Week of Viva La Verve. (I did the 1st one last week; but I haven't uploaded it to my SCS gallery yet.) I have really been liking the look of lots of white space and the dry embossing on white as well. I really wanted to keep this card pretty simply, so I chose a color palette of Enchanted Evening, White and Hawaiian Shores. The sentiment is a Plain Jane from Verve and the "xoxo" at the bottom is a little stamp found in Verve's "Tag Time" Set. The flowers, are of course, from Prima. In the photo, the center flower looks cream; but it's actually white. Now, on to the second card! This one is for February's SFYTT challenge (In case you don't know what that stands for it's Sketch for You to Try!) What a fun sketch this was and easy to work with. I decided to make a card that I can send to my hubby later since he will be gone for a while longer yet. I took this picture outside and well, you know me...always taking crooked pictures! Anyhow... I used Kraft, Dark Chocolate, White and Ruby Red for this card. The heart stamps and the sentiments are from Hero Arts "Year Round Sentiment" set. Not a whole lot really to talk about this card. It's really as simple as it looks! Have a great day everyone and enjoy the rest of your weekend! Well, let me just start out by saying that this picture is about the 10th one I tried to take of this card. I just couldn't get it to come out the way I wanted it to. Trust me, believe me when I tell you that yellow background is NOT that bright! UGH!! It's actually a darker and more mustard/curry looking. I don't know why on earth I couldn't get it to photograph the way I wanted it to. Ok, well it is what it is, I suppose. And what this is, is my version of this week's CASE Study Card. I wanted to make a birthday card and I really wanted to make one that could be given to a little boy. I don't make a lot of kid friendly cards, and I definitely don't make nearly enough boy cards. I tried also to find as many colors as I could for this week's Color Throwdown challenge. 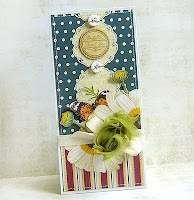 I used stamps from Hero Arts "Year Round Sentiments" and Verve's "Tag Time"
I made my card a standard sized card instead of a skinny one; but I try to keep the basic layout and tried to pull some of the similar colors from the CASE card. Ok, that's it for me today! Enjoy your evening and I'll see you all soon! Just a very quick post to share a card that I've made for the Hero Arts February Challenge. This is my first time entering the monthly contest challenge and to be honest, I really didn't decide until this morning. I woke up this morning planning to work on yesterday's Mojo Monday sketch and my mind just sort of veered off in another direction. I always like to get involved with challenges and contests as often as I can. Not because I'm some great stamper worthy of prizes and rewards (although that would obviously be nice! ); but because I think being involved with the various challenges and competitions that are out there forces me to really push myself as it relates to creating. It makes me take the extra mile with a card such as inking the edges with distress ink as I did with this card. It gives me the courage to pull apart a card and re -vamp it if it "just doesn't quite look right" For example, I pulled this card apart 3 times before getting it to how I wanted it to be. After all, if it isn't satisfactory to me, how can I expect someone else to think it is? I am very fortunate that right now I have 3 children who are all in school every day and right now I'm not working, so I have the time to spend doing this hobby I enjoy so much. That will change soon I know, and when it does, I'll put all my "toys" away like a good girl and accept my responsibilities. Until then, however, I will continue to stamp all my cares away!! For this challenge, I tried to combine elements of each theme for the challenge: The Sketch, The Friendship Theme and using Diecuts. I used two sets of Hero Arts stamps: Classic Fabric Design and Live Life. Thanks for stopping by and visiting me today, my play time is all over for today; and now I am going to go do something at least a little bit worthy of my title as "Domestic Goddess"